Founded in 1206, the Saxon capital was divided in 1485. Embellished with Baroque splendour, Dresden was known as the 'German Florence' until it was flattened by Allied bombers at the end of World War II. Painstaking restorations of the city have again recreated this delightful capital of Saxony on the River Elbe. The Semper Opera House, rebuilt after the fire of 1869, saw the premieres of Wagner's 'Rienzi', 'The Flying Dutchman' and 'Tannhauser'. Eight operas by Richard Strauss were premiered here this century. The most famous hotel in Dresden, its building dating back to 1709 accommodating Royal guests. 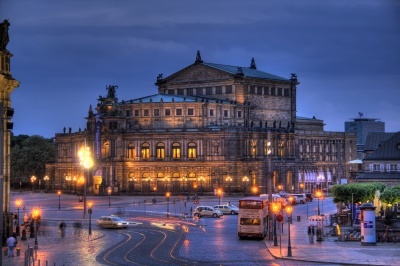 Located in the heart of the city next to the Semperopera House and the Zwinger. Centrally located in picturesque gardens. On the banks of the River Elbe. Has two restaurants, cafe/bar, swimming pool and fitness centre. Quiet but centrally located near the river Elbe, within 15 minutes walk of the historical centre. A privately owned hotel in the historic part of Dresden – its restaurant has 1 Michelin star.